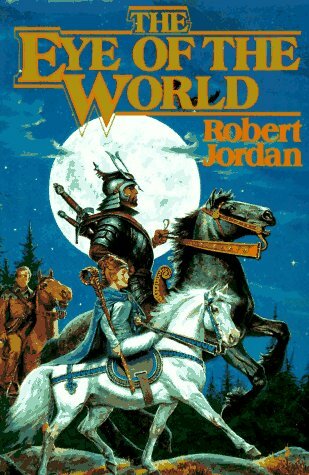 The Eye of the World by Robert Jordan is an extremely good book. It is about three boys from the town Two Rivers, named Rand, Perrin, and Mat. It all starts one day when the three of them are just doing all their farming duties, and they all see this mysterious black almost ghost like figure, called a Fade. Then half human-half animal creatures, called trollocs, started attacking their village, Emonds Field, one of the Two Rivers villages. After those attacks two strangers, named Moraine and Lan who happen to be an Aes Sedai (a woman who can touch the "woman half of the True Source") and her Warder (man who protects their Aes Sedai), come and tell Rand, Mat, and Perrin that they were being pursued by the Dark One. Joined by Egwene, an adventures village girl, and Nynaeve, their village "wisdom", they set off on an adventure to "The Eye of the World". My favorite character is probably Perrin. I guess I like him because I think that Rand is to Main-Character-y and that Mat is just plain boring. Actually he's my favorite main character, my real favorite character is Nynaeve. I like her because she's so to-the-point about stuff and she is about the only person who Rand, Mat, or Perrin will always listen to. My mom says that she's "strong willed" and that some people like that in a character, and some don't. I hope you love this book as much as I did! It's been a while since I've read the first book and I've read all of them since then. It's interesting to see a "newbies" take on the characters the first time through. My first thought was 'Mat? boring? ', but then I remembered back to the beginning and see where that would come from. What do you think about Lews Therin? Well, I think that Lews Therin and Rand are one in the same and I hate Rand. Though, Lews Therin isn't much of a character right now, so if he gets to be more of a major character I might have a different opinion. Mat absolutely ends up awesome, but it takes until books 4 & 5 for him to get that way.